Pull the plug on that autopilot and consider doing this instead. Create a challenging, realistic practice activity (not a knowledge check). The activity asks people to make the same decision that they need to make on the job. It’s probably a scenario. Identify the minimum that people need to know to complete that activity. Make that information available as an optional link in the activity. Let people pull the information when they need it. Plunge people into that activity with no presentation beforehand. Once people make their choice, consider showing the necessary information in the feedback. First show the consequence of the choice (continue the story). Then show the information that the learner should have looked at. This will satisfy the stakeholder who says, “But they all have to be exposed to the information!” Here’s a basic example. The result is a stream of activities in which learners pull the information they need. It’s not a presentation occasionally interrupted by an activity. With careful design, this approach works with all types of information, including basic concepts, mental models, step-by-step procedures, and detailed product specifications. The trick is to start with an easy-ish but still interesting activity and increase the challenge. For example, if you want people practice a procedure that requires some tricky judgment calls, your optional information could include the procedure itself, tips on how to complete each step, and worked examples of the trickier steps, such as showing what a fictional person thought as they made their decisions for that step. However, you don’t dump all this information on people at once. The information available depends on the step that the learner is completing. Your first activity could have them complete an easier step with just the procedure document and some tips, and as the activities progress, the decisions become harder and the optional help focuses on the trickier steps, with worked examples. Make sure you say clearly and often that no one is tracking what people click. Encourage them to try all sorts of options to see what happens. This online chapter from Douglas Fisher and Nancy Frey’s book Guided Instruction gives a helpful overview of the technique, although the classroom example at the end isn’t the type of scaffolding that I’m describing. If people can look at a reference on the job, have them use the same reference in your practice activities. Their learning is more likely to transfer to the job, and you save yourself the hassle of recreating the job aid. If people need to memorize some information, ask yourself, “If they apply the information in several activities, will they end up memorizing it?” If the answer is “no,” this is probably the only argument for drills that I’ll ever make: You might link to a gamelike drill to get the information into their memory, and be sure to provide spaced practice. Instead of packaging all the activities as a take-it-and-forget-it course, consider delivering them spaced over time, such as one activity every few days. Research shows we learn better when we practice over time. 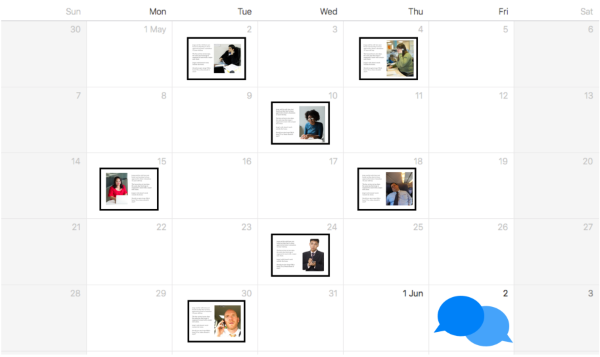 You can space your activities because each activity is self-contained — it links to the information needed to complete it, rather than being embedded in the middle of a presentation. If you’ve made the activities get progressively more complex, you’ll want to maintain their sequence during the spacing. Consider ending the sequence with a live discussion to help people synthesize what they’ve learned. Another option is to make the activities available for people to try whenever they want, probably with a recommended order of completion. They’re grateful that you respect them as adults with life experience, instead of assuming they’re all equally ignorant. You help them develop a motivating sense of mastery. No one will have to sit through information that they don’t need. The only people who will look at the information will be the ones who need to see it. Research into productive failure suggests people learn better when they struggle a bit, which is why we should jettison the genies and let people think for themselves. You’ll find several more reasons in this post. Finally, you’re designing activities because you analyzed the performance problem and saw that practice will help. If you involved your stakeholders in this analysis (as you should! ), they’ll no longer obsess over presenting and testing knowledge. Instead, they’ll commit to changing what people do. I write about this a lot because it goes against “the way we’ve always done it,” which still dominates our field. Here’s a walkthrough showing how to do this in more detail for people who diagnose squealing widgets. This example shows how you might do this for soft skills. If you’re doing technical training, focus on what they need to do. Finally, here’s an interactive workflow of the entire process. For a lot more on helping people learn through scenarios, consider signing up for my scenario design course, which starts in May. The sessions include one in an Australia-friendly time zone. Your posts are always great affirmations and reminders. Thank you! One area that I find it hardest to design scenario-based learning is for imparting the facts and figures clients demand be included with their onboarding curriculum – stuff that isn’t critical to their on-the-job behaviours but that could be arguably valuable for the learner to readily integrate into the cultural lexicon of a company. I usually try to get through that stuff as quickly as I can with the most compelling, cheeky and enthusiastic facilitated presentation I can muster in order to get to the behaviours the client is after. How do you handle this kind of ultra-dry awareness information? Or rather, how do you design onboarding training? Thank you for your time and mentorship. Hi Joel, I agree with Yvette that if the information really will help them adjust to the company, it could be linked in a scenario as described above, because the employee would need that information to make a decision, even if it’s a trivial-seeming social decision. If the facts & figures support behaviors like that, then they could be linked to practice activities. Wouldn’t corporate training and PD have amazing impact if we could get all trainers/educators/instructional designers to use this method??? I teach corporate trainers this method and, at first, they find it a bit confronting but once they have worked with the end deliverable, they’re on board. Needs analysis are still sadly overlooked in most organisations, but we continue to advocate. Thank you for spreading your method in such a simple and compelling way. Joel – for induction training I still use scenarios or case studies. Go back to the WHY. Why might this information be useful or why is it included and build a realistic scenario about that. If there is no why and you can’t think of how the information might make be useful or contextualised – perhaps it shouldn’t be there. Cheeky is ALWAYS necessary. Thank you Cathy. 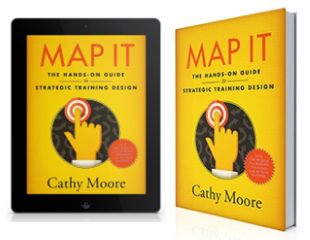 I’d like to ask when your book “Map It: The hands-on guide to strategic training design.” will be published. Hi Andreas, the book is getting another chapter or two. It should be available in a couple of months, depending on how long the layout person needs. For over a year, I’ve been trying to implement the activity-first, theory-later approach you advocate in the blog. Both, as a college professor and an online teacher. Since, your approach made intuitive sense to me, I was expecting unequivocal success with this approach. But the results have been rather mixed. If the students are advanced, it works like magic. But if they aren’t, they falter (and even complain why I don’t explain the concept/theory first). Lesson learned: The activities must be very carefully stacked. PS. I’m also really looking forward to the book! Just one question – will it be a comprehensive take on instructional design or a specific aspect of it (such as scenario design)? Hi Satyajeet, thanks for your comment. Research supports what you’ve found: people who are new to the topic need more hand-holding, so you need to sort of ease them in with activities that help them get the basics first, providing lots of optional help. They might especially need worked examples showing how a fictional person solved the problem, including how they thought and why they made the decisions they did. The book will focus on using action mapping in the business world. It will include how to diagnose a performance problem, determine the role (if any!) of training in solving the problem, and design targeted, useful practice activities for the parts of the problem that will benefit from training. Practice activities are the same as scenarios, basically, so you could say the book focuses on scenario design. If the analysis of the problem suggests that people also need to memorize a lot of information, I just point the reader to the many already existing materials that show how to present and test information. I just realized that you’ve drawn the distinction between instructional design for academic institutions vs. businesses. And why it may not be suitable for the former. So, now it makes sense why I had difficulty with activity based learning with undergraduate students. Thank you for the clarity on your book. Would you say that your book on action mapping has a broader scope than your course on scenario design? Or do they cover the exact same ground? Satyajeet, thanks for following up. Scaffolding (starting with easier activities and lots of help, and then increasing the challenge) should work both in academic and business learning, but in this blog I focus on business training. 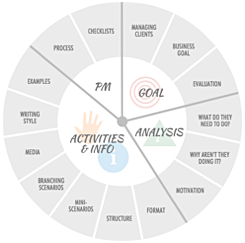 The book goes into much more depth on action mapping, including what to say to your client, how to analyze a problem, how to brainstorm activities, etc. The scenario design course goes into more depth on scenario design specifically, and includes personal feedback and ideas from me and other participants that won’t be available to book readers. Thank you Cathy! I really, really look forward to your book. I’ve wondered how to contrast your approach, with the approach of online pioneers like Coursera, edX and Khan Academy? I feel that they may have democratized learning (highly commendable), but they are firmly in the information-first, activity-later camp. And to that extent they aren’t as engaging as they could potentially be? Hi Satyajeet, I agree that the “lecture, then activity” approach used by the sites you mention would probably be more memorable and effective if it were more activity-driven. At the same time, their goal tends to be general knowledge dissemination to a wide audience, rather than, for example, “Change how the 1,437 people in Division X sell our widgets.” So they’d struggle a bit to come up with realistic activities that their very broad audience would find relevant. I’ve been championing your Action Mapping technique to a Basic Instruction Class here in the USAF. We are more of a trade school that is training people for fulfilling roles in the field so it makes sense to them. You say in quite a few places that academia is not the place to use action mapping, and yet I wonder (along the same lines as Satyajeet above) if we shouldn’t be thinking in those terms (activities built towards/around goals) even when teaching basic concepts. I just had a conversation with a student who said he passed physics on the third try because of a teacher who ‘brought it down to earth’ and showed how it applied in the real world. Could we not think in ‘goal-based’ terms when designing purely academic instruction as well? I so appreciate your work look forward to your continued efforts and thoughts in the field of instruction! Hi Alan, thanks for your comment. I agree that academic instruction would benefit from a focus on real-world activities that support goals. My caveat about action mapping in academia is that, in my experience, teachers have trouble setting goals that don’t just measure knowledge transfer, and they tend to write actions that are test-style objectives (“Explain the importance of…” or “Define…”) rather than describing real-world tasks that someone needs to perform in a specific setting. It makes total sense that they would have trouble identifying a more business-y goal and listing real-world tasks, because they’re in a world where the most common measurement is a knowledge test (though as you know the more trade-school approach can evaluate people based on their ability to perform actual tasks). Because they’re in this environment, when they use action mapping, they strip out major aspects of it, such as skipping the step in which we analyze the workplace and look for barriers to performance. 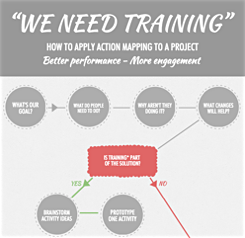 As a result, in academia, action mapping becomes a way to organize content and brainstorm activities for a knowledge-transfer project, when I really intend for it to be a way to solve performance problems in the workplace. Thanks so much for the in-depth reply! That makes sense. As a participant in a Basic Instructor course, I combined a brief explanation of your Action Mapping flowchart with Gilbert’s BEM in a presentation and it resonated with my audience of future instructors. They might have occasion to deflect ‘We need training!’ requests in the future so I pointed them to your website and flowchart to at least plant the seed of how to respond. I really liked how you mentioned that one should use, “real world job aids”! I don’t know how many times I’ve received training on a job and thought to myself, “how does this really apply to what I actually do on the job?” This was a great read. I really enjoyed how enlightening it was. Thank you so much for sharing this. its really very helpful. I was actually planning to start an online course on Digital Marketing but,I was uncertain about the flow of the study material. Thanks to you, I now know how exactly to proceed. 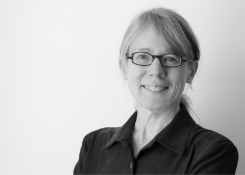 Hi Cathy, thanks for the really useful guide to rethinking our elearning delivery by starting from any of the fresh approaches you suggest. I have plenty more to read on your site! Cathy, I appreciate your suggestions on how to really involve learners. I am a graduate student in an instructional design program and have no (practical) experience on the teaching side of things but I have plenty on the student side. I’ll say that your suggestions would all be welcomed by me if I were your student. I’m intreagued by your mention of the research in productive failure. I certainly hate learning this way, but believe that research supports the learning success that comes with failure. I’ll look more into that. I’d be curious to know your thoughts about how to increase a students sense of confidence prior to starting a method like this. Or if you would advise this method only for the more confident of learners. Complex problem solving (as your model seems to favor) require students to actively interact with their environment. For individuals lacking in confidence, do you suppose that they may approach this model with fear? Hi Lisa, the scaffolding mentioned in the post is how you build people’s confidence. 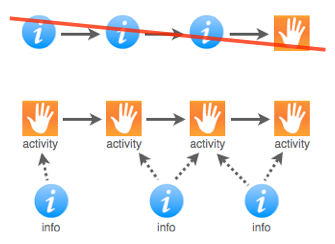 If the material is elearning, it’s also a good idea to make clear that people’s choices aren’t being tracked. You can encourage them to try other options and otherwise make clear that they’re exploring, not being tested. Thanks Cathy, for guiding us about the E-learning delivery system. There are various points in this blog which help me to understand the thinking of learners. It is really an informative blog. I once did training in a contact centre for staff who would have to take on a whole new workflow to support a new legislative change. I got a project team member to create about 20 scenarios reflecting the FAQs we thought customers would ask. We had one two hour learning session with the reps to cover everything. Fortunately we had a subject matter expert in the room, although not the kind that you would ask to coach others. In the session I gave a brief introduction of the main purpose of the legislative process and the learning method. The SME shot disapproving daggers at me throughout – she was sure this method would fail because I wasn’t doing detail of legislation clauses, no background history of the project team, no walk through of the processes involved first. But she was committed to good practice on the job. Then I got participants in pairs to work through the scenarios together using the knowledge base they would have on the job (created by the project team) – basically chucking them in the deep end with support but without explaining everything first, the way you describe. The SME and I then went around the pairs to answer questions and support. Before the close of the session we did a debrief in the big group. They had got through about half of the scenarios in the time we had. They reported that the practice of repeatedly using the tools available on the job to learn where to find information to answer the customer’s query was very successful. They said they had really high confidence levels in their ability to do the job when the legislation went live and high levels of commitment to finishing off the rest of the scenarios in their own time. Also said best training ever etc and were very enthusiastic. I felt like a fraud it was so easy. How to respond to "Make one course for everyone"
What's the real cost of eye candy?